India’s largest poker site – adda52.com continues to create ripples in Indian poker industry by bringing super-value tournaments with unbelievable prizes and giveaways to its players. 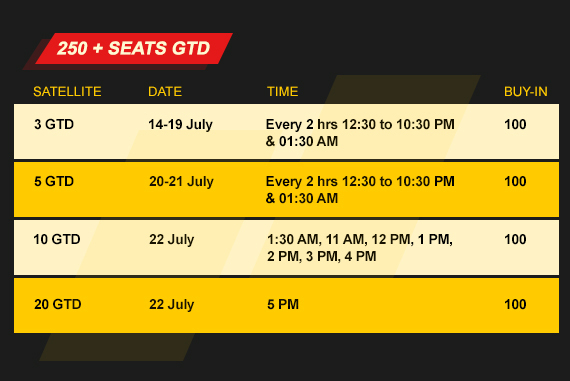 Taking this legacy forward, the poker site has now introduced ‘One Time’, a brand new tourney with 15K starting stack, which happens on 22nd July at 5 PM and boasts INR 10 Lac for the 1st place at as low as INR 1000 buy-in. Adding to the delight, the poker site has finally revealed the big news you all have been looking up to. There is INR 1 Lac in store for everyone making it to the final table (2nd – 8th rank). The excitement does not end here only. Even if you miss the top spot, you still have a chance to convert your INR 1 Lac into INR 10 Lac in 2nd to 8th place on the final table. All you need to do is play 2500 hands on 100/200 & above tables from 15th to 21st July this week. So, what are you waiting for? Simply log onto adda52.com and get a chance to convert INR 1 Lac into a hefty INR 10 Lac ahead! How To Enter ‘One Time’ on Adda52.com? To the delight of poker players in the country, there are multiple exciting ways they can win themselves a seat to this much-anticipated tournament. Adda52.com is hosting a range of online satellites, giving players a chance to win tickets to ‘One Time’ for as low as INR 100. The satellites have already started on 14th July and will be running daily at different time slots till 22nd July. Additionally, some exciting contests are being run across Poker Groups, Adda52, Adda52Live and OPN Facebook pages, with multiple tickets up for grabs! Players can enter the much-anticipated event directly at just INR 1000 buy-in. Overall, there are multiple ways to enter. The choice is yours! So, if you have been paying hefty buy-ins for bigger GTD tourneys, it is time to ditch this monotony. Just invest INR 1000 or qualify at just INR 100 and get to win INR 10 Lac in ‘One Time’ this Sunday!